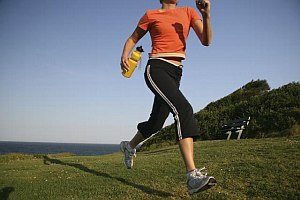 Health magazine has these quick tips to help you get motivated to run a race. I know that it has been a goal of mine to run a 10k for a long time but pushing through that tough training and having my body heal between workouts is the tough part. Need help in the motivation department? Sign up for a 5K or 10K. Suddenly, your exercise routine becomes ‘training’ and every workout has a purpose. Plus, your competitive spirit is bound to keep you fired up and help you push past what you thought was impossible. Here’s how to ace the race. Find your ideal race. If you usually do 1- to 2-mile runs, try a 5K (just over 3 miles). If you can comfortably do 3 to 4 miles, go for a 10K (a little more than 6 miles). Find a race online at Active.com or by checking with a local running store (expect to pay around $25 to enter). Leave plenty of time to train; 8 to 10 weeks is ideal. Then tell everyone about it better yet, ask them to join you. Get with a program. You can go to Training Programs to download one of my 5K or 10K race plans and a running log to track your progress. Post the log on your fridge with a map of the race course for inspiration. Prep for race day! That morning, eat a high-carb, low-fat breakfast (my favorite: peanut butter on toast with a banana) and drink 8 ounces of water at least 2 hours before the race starts to allow time for digestion. Arrive at least 45 minutes early, so you have time to settle in and warm up with 5 to 10 minutes of easy-paced walking and running. When it’s time to line up, aim for the middle (or back) to avoid getting mowed over by the quick starters. During the race, back off a little for the first half, then turn up the speed in the closing miles; you’ll run better, stronger, and faster (and look fabulous in that finish-line photo). Once you cross the line, keep walking to cool down, and drink some sports drink or chocolate milk within 30 minutes to refuel your muscles. Then celebratehey, you deserve it!